I am loving these sunny summer days especially because it means more barbecues and more delicious eats! This batch was made with what was left in the crisper. I recommend adding broccoli and bell peppers! Below is a recipe for a favorite pasta salad of mine. It's fresh, attractive, easy, and not as heavy as cheese or cream-laden pasta salads. Plus, my milk-allergic kids can eat it! You can play with the amounts of pasta and veggies and you can switch out different vegetables depending on your tastes. When I'm making it on a whim, it's got whatever is left in the fridge (usually celery, carrots, tomatoes, corn). I try to make this dish as colorful as possible -- bell peppers (red, yellow, orange, green), celery, carrots, broccoli, tomatoes, corn -- there are so many ways to go! When you are making the dressing, do keep the ratios the same. You may find that you need to double the dressing recipe or half it depending on how big your salad ends up being. This recipe is free of 7 of the 8 most common food allergens. By substituting brown rice pasta for regular pasta, you can make this completely free of the top 8. Combine all dressing ingredients together. Stir until sugar is well mixed. Chill in refrigerator for at least a couple of hours to allow the flavors to combine. Cook pasta according to directions on package. Drain and rinse with cold water. Set aside to further drain. Add chopped vegetables to pasta. Gently mix until vegetables are well distributed. Toss pasta veggie mix with dressing until everything is evenly coated. Refrigerate at least a couple of hours before serving to let dressing absorb into pasta. I like to make this pasta the night before or morning of a barbecue. It's best when the pasta has had time to absorb the dressing. This summer means Ryken's first summer camp, day trips (and most likely more eating out), weekend getaways, and preparation for the next school year. For our family, the latter will be a new experience since Ryken will be attending a Spanish dual immersion. As a safety measure Ryken already wears STATKids wristbands to alert people of his dairy and peanut allergies. I really love how flashy they are but we've had some problems. We have to make sure the bands don't get hidden under long sleeves or ignored because of the myriad of silicone wristbands and Silly Bandz that kids wear these days. I decided I needed to invest in more allergy identification to improve our chances that people would take note of Ryken's allergies. And with a student body and staff of English and Spanish speakers, I wanted to make sure I got allergy identification in both languages. I came across Allergy Alert Stick Ons, a company based in Ontario, Canada. With contrasting colors (red, white, black), large typeset and helpful graphics for the major allergens, the stickers looked like a helpful indicator for food allergies. One of the examples shown on their website was a "No Nuts and No Dairy For Me" sticker (hey, perfect for Ryken!) that easily convinced me that this product was worth checking out. I submitted an order request and got a prompt response from the very helpful Petra. Petra sent me an electronic proof of the sticker for my review. I mentioned to her how the visuals will be very helpful in Ryken's bilingual school. It was at this time that Petra suggested we could create an alert sticker in Spanish. We could do half of the order in English, and half in Spanish. Right on! Petra offered to find out the Spanish wording using an online translation program. (Neither of us knows Spanish.) I cross-checked what she came up with my husband's 4 years of Spanish, my own online research, and native Spanish-speaking friends and came up with some corrections. The translation was lengthy. I worried over how we could convey all the allergies without making the sticker a confusing mess. Petra listened to my concerns and did an outstanding job with arranging the text so that everything fit and looked great. All in all, it took more than a dozen emails, several mock-ups, and the help of my Spanish-speaking friend, Javiera, but I think I got what I wanted. Did you know there are three ways to say "peanuts" in Spanish? I wondered if I could adjust the graphic to make the tree nuts a little more prominent (the peanuts are much larger than the tree nuts if you check out the sticker in English). The ever-helpful Petra said this was no problem and, as you can see, she adjusted according to my request. The stickers took two weeks to arrive (from Canada, remember?). When I opened them, they were exactly as I had seen in the final proofs, only bigger and better! The bigger the sticker, the better at being seen! The stickers were nearly 3 inches (7.5 cm) in diameter. Okay, so it does say on the website that the stickers are 3"x3". But the site's examples have been slightly reduced in size to fit the site's format so I was expecting something a little smaller. I highly recommend that you check out Allergy Alert Stick Ons especially if your kids have multiple food allergies or need a translation. The company's service is excellent, you get to see your product as a proof so you will know exactly what you're getting, and the final product is first-rate. The stickers are sold in packs of 30 for $12.50, which I think is a great price considering that the stickers are customized according to your needs. I do recommend that if you would like your sticker translated into another language that you consult with native-speaking friends to make sure you've got the message right. Using online translations have their limits! When you're ordering, feel free to let them know Irene from GetAllergywise sent you. And don't forget to share a photo of your personalized stickers with us! Product update: Trader Joe's Whole Grain Milk has been discontinued! RIP July 2011. Help bring it back! Last week I was shopping in Trader Joe's and noticed that they were out of their lightly sweetened whole grain milk. I figured it wasn't a big deal. Sometimes it takes a couple days for shelves to be restocked. I bought a couple cartons of their unsweetened variety and figured I could just buy more whole grain milk next time. Yesterday I still couldn't find any of our usual whole grain milk. A GAW reader was kind enough to inform me that Trader Joe's has discontinued its whole grain milk line. Noooooo!!! I visited the company's website and sent in a comment. Nikki of customer relations promptly replied to my concerns and confirmed that Trader Joe's has indeed discontinued selling whole grain milk due to poor sales. She did say that the company is always open to hearing from its customers. So if many customers contact Trader Joe's about a product's cancellation, the company may bring it back. Our family loves Trader Joe's whole grain milk as an alternative to cow's milk and almond milk (to which my boys are allergic) and soy milk. Compared with similar offerings at Whole Foods, Raley's, and Safeway, it is affordable and tastes pretty good. If you are one of the many people who rely on whole grain milk as your dairy or soy substitute, I encourage you to write Trader Joe's immediately. Your letter could make the difference! *Update: FYI: I bought some of the last cartons of Trader Joe's whole grain milk while on vacation in L.A. I reread the label and now realize that it *does* contain soy in the form of soy lecithin. I know some soy-allergic people can handle soy lecithin just fine but many cannot. So this alternative might not work for milk- and soy-allergic people. Almond milk does not contain milk or soy. I hope Trader Joe's comes back with a similar milk substitute free of all the most common allergens. The recent research study on milk allergy desensitization by Stanford has given me so much hope. Could there be a treatment to rid my kids of their milk allergies? Generally speaking, I try to think of the positive. I'm a "glass half full" kind of gal. And what I have in my glass is a lot of gratitude for the wisdom that living with food allergies has given me. I have learned more about what goes into growing and processing what we eat, and what foods our family can and should do without. This has definitely led to healthier, fruit-and-veggie-filled choices for meals and snacks. I have become a lot more assertive as far as advocating on my kids' behalf at school, among family, and within our different social circles. When you manage food allergies, you learn quickly to speak up loudly and often. Over the years our family has adapted well to the speed bumps presented by food allergies. Our kids are happy, healthy, regular kids. As glad as I am with how our lives are, there is no doubt in my mind that life without milk allergies would be better. A hundred times better. And it's not just about being able to eat cheese and butter. It's about safety, convenience, and inclusion. Families without food allergies get a glimpse of what it's like for milk-allergic kids at get-togethers. The looks of yearning as other kids devour pizza, mac 'n' cheese, and finger foods; eyes transfixed when the fancy birthday cake is brought out, followed by, "Mommy, does that have dairy? Can I eat it?!" Pouting, grumbling, and tears when the off-limits dessert is served. Every party is an emotional up-and-down when you have a severe food allergy. Food allergies, from the parents' point of view, are also an emotional, mental struggle. I can say without overexaggeration that my kids' allergies are always at the forefront of my mind. Last year, whenever the phone rang during Ryken's school hours, I tensed up and braced for a voice on the other end telling me about an accidental ingestion. (Thank goodness, that did not happen.) I feel my blood pressure rise when we are at a playground or library and other kids are running around with cheese sticks, Go-gurts, and peanut butter sandwiches in hand. I used to love to travel. Nowadays, an invitation to travel is met with hesitation because of the risks and detailed planning involved. There is a knee-jerk reaction of panic when we first commit to going somewhere. "How will I feed the kids?" "Will I have access to a kitchen?" "Will there be cell service and a hospital nearby?" Even when we have been very careful with vetting foods for group camping trips and finding out "safe" choices from a restaurant's menu, we've still made mistakes or been plagued with random hives from Lord knows where. This week Ryken begins his first full-day summer camp that is half an hour away from our house...and I really nervous about it. Unless you have a child with a life-threatening health issue, it is hard to describe what it would mean to be free of the ominous cloud that is food allergies. To spontaneously go out without having to tote all of those meals and medications. To drop your child off at a playdate without fear. To casually choose something off a restaurant's menu without a second thought as to whether it could make your child sick. To be on a plane and worry about whether your kids are going to kick the seat in front of them but not about whether they're going to have some freak allergic reaction while you're halfway across the Pacific. I am looking forward to following the Stanford team's research as they treat a wider pool of patients. I am very hopeful for progress in treating food allergies. Really, hopeful is all I can be. 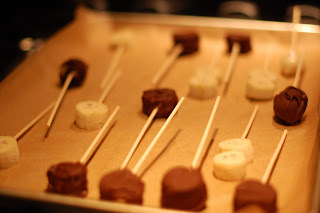 Mmm...remember frozen chocolate covered bananas? The ones you get at amusement parks for like $6? Well, you can make them at home for cheap...and without fear of dairy in the chocolate. And the ingredients are simple. Slice your bananas into 3/4 to 1 inch disks. 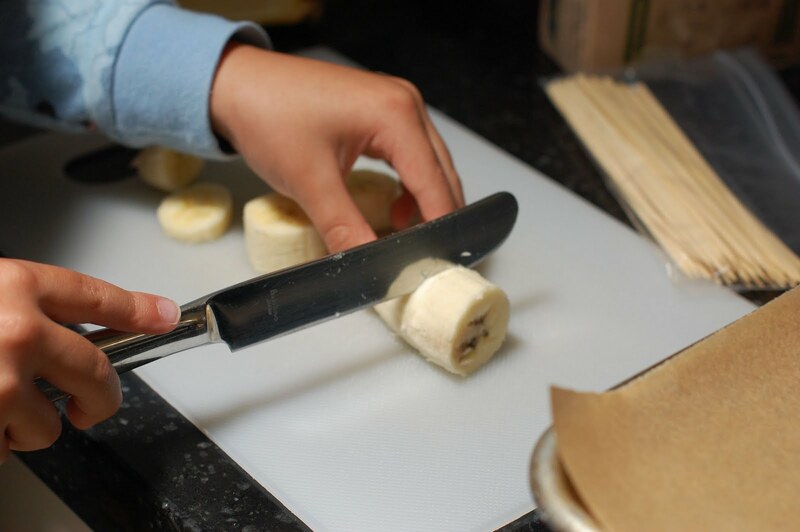 Making sure the banana parts don't touch. You'll see here that the kids wanted to make "doubles"...that's fine too. 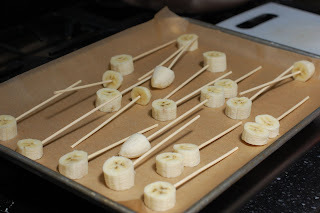 I even used the ends...hey, when it's coated in chocolate, the kids will still eat them. Put the tray in the freezer for at least 2 hours. Start dipping! The chocolate will start to harden immediately, so you gotta work fast. 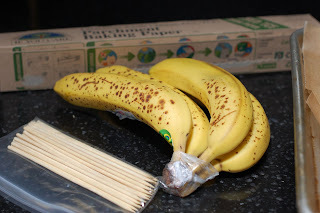 If you notice your bananas beginning to thaw a bit, stick them back in the freezer. They need to be super cold for the chocolate to stick and harden. If you want to, you can put the dipped bananapops back into the freezer to chill before eating...but really, who can wait? Not my kids. Eating out won't be as stressful for us with Select Wisely cards in hand. Our family doesn't eat out much because of our kids' multiple food allergies (dairy, peanuts, various tree nuts, kiwi, halibut). When we do, it's always a task to choose a restaurant that we think will be the best bet at keeping our kids safe. We always stay clear of these types of foods: American (dairy), Indian (dairy, nuts), Italian (dairy), sushi (imitation crab meat can have dairy! ), Mediterranean (dairy), Mexican (dairy). We tend to stick with Chinese and Thai restaurants and make ourselves repeat customers when we've had positive experiences there. While some Chinese and Thai dishes do have nuts, I felt like we could maneuver around that problem easy enough by explaining the kids' nut allergies. (Note: Ryken has a moderate peanut allergy. If he were highly allergic to peanuts, I would think twice about Thai food.) I have found that restaurants are usually much more attentive to nut allergy concerns. There is more awareness of the serious dangers of nut allergies whereas a milk allergy is a lot less common. Also, on the whole, nuts are not an integral part of all Chinese or Thai cooking although there are some dishes cooked with peanut oil or garnished with grounded peanuts and peanut sauce. So on a personal level, the dairy stuff really worries me the most. Because dairy is in so many forms -- milk, butter, margarine, whey (casein), cheese, chocolate, and yogurt to name a handful -- I think it's a lot easier for wait staff and cooks to miss an ingredient when checking for allergens. I think this is what happened on our Mother's Day visit to our favorite Thai restaurant. We've eaten out a little more recently and discovered how frustrating -- and potentially dangerous -- it is to try to explain to a waiter in my broken Cantonese that my kids are allergic to milk, peanuts, and tree nuts. (I still have no idea how to talk about tree nuts!) My limited Cantonese was meaningless to Mandarin-speaking waiters. After two especially nervous-making dining experiences I remembered about Select Wisely translation cards. Select Wisely sells translation cards for important health-related information. If you have food allergies, penicillin or latex, diabetes or special dietary needs, you can purchase medical alert cards in the foreign language of your choice. Select Wisely offers translation in over 60 languages. Enclosed in thick laminate, the cards are wallet-sized and come in sets of 2, one for your wallet and one for safekeeping in your suitcase. I ordered the "Strongly Worded" food allergy cards for milk products and nuts/peanuts/peanut oil. There were two types of Chinese cards -- one is written in traditional Chinese and another in simplified Chinese which has been taught in mainland China since the 1950s. I ordered the traditional Chinese (used in Hong Kong/Taiwan) in the hopes that this might be more universal. When the order arrived in the mail, I was excited to receive some freebie nut allergy alert cards and emergency cards. Strongly worded card for milk allergy in Traditional Chinese. Reverse side of the strongly worded card for milk allergy. Strongly worded card for all nut allergies in Traditional Chinese. Reverse of strongly worded card for all nut allergies. A handy emergency card that the company sent me for free. We have used the strongly worded cards once so far. I explained the food allergies to the server and then presented her with the translation cards. The cards were promptly shown to the cook who okayed our order. I saw the cook peering outside the kitchen later (perhaps to place a card to a little kid face) and I felt much more at ease knowing that the restaurant staff knew exactly what our allergy issues were. We had a delicious meal without any problems. Phew. I have just ordered more Select Wisely cards in Spanish and Thai. While I'm not yet ready to book any international vacations, these will be great to have if we find ourselves dining out on one of these busy summer nights. So my four-year-old went to the dentist today and sat still with his mouth wide open for the first time ever. Oh, he'd been to the dentist before, several times in fact--with his mouth plastered shut. But after a visit to his preschool from a local dentist showing him how things worked, he changed his tune. And upon his first dental examination, we found out that he has a cavity, and another one forming (eeek!). I don't know about you, but my day-to-day food goals for myself and my food allergic children are to get through the day without incident, eat a variety of foods as healthfully as possible on an allergy-safe diet, and have some fun along the way. We have several very good friends who are dentists, and I get an earful all the time, but the kids' teeth are just not first and foremost in my mind. Add food allergies to some stubborn kids and a few bad eating habits, and what you get are childhood cavities. I'm not going to claim to understand how all of this works, but apparently if you can reduce the number of times your kids are exposed to acid attacks, you can reduce plaque and cavities. You can do this by avoiding the foods that are causing it, and neutralizing the acids (keeping teeth their cleanest!). In other words, our job as moms is to make more tooth-healthy food choices, and ensure that our routines support good oral hygiene. The more acid attacks, the worse off your teeth are. So it makes sense that the more often your kids snack, the more prone they are to plaque and cavities. Ok, we're not going to starve our kids. And the word toddler may as well be synonymous with the word grazer. But we can try limiting snacks and we can give them snack options that are not only good for their bodies, but their teeth too. Foods like fruit roll-ups and fruit leathers, juice boxes, sports drinks, crackers, chips, and cookies (sticky and high-carb), are the worst culprits. Anything sticky, gummy, and chewy tend to stay on the teeth all day long. My kids love raisins and crackers, but in the dental world, you should limit these snacks to when you can brush afterward (like for dessert). And of course, candy is a big no-no. I believe that dairy-allergic kids are at a disadvantage here. Because they can't drink cow's milk, many turn to alternative fortified milks to supplement their calcium intake. And lots of these milks have added sweeteners. It's best to start off on the right foot and try to find a variety with less or no added sugar, because once they get used to their milk, it could prove difficult to change on them. 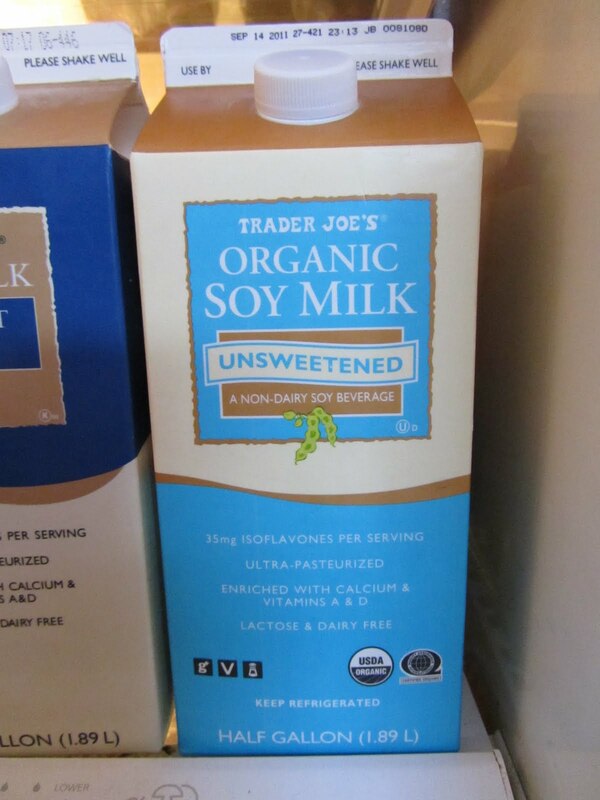 If your kids are not soy-allergic, try Trader Joe's unsweetened soy milk (light blue and white carton). Beware of milks called plain or original, as they will often have added sugar. And, we've heard it a million times, but please don't let your baby/toddler fall asleep with a bottle in her mouth! I know, brushing and flossing two, three, four or more mouths twice a day sounds daunting. Especially when you have a 7:45 am school start time (yes, we do!). But it has to be done. And not just any brush will do--electric brushes are more effective than manual ones, especially when you have a particularly squirmy child. Let them watch you brush with one, and get them used to it when they're still young. Don't forget to wait 30 minutes after eating to brush to let your natural acid-neutralizing saliva do its job. One of my dentist friends said that they will always tell you to floss twice a day, but that once will usually suffice (it'll be our little secret). As long as the once doesn't turn into every other day...once a week...and then almost never. The kids will get into the habit and it really is a lifelong habit. 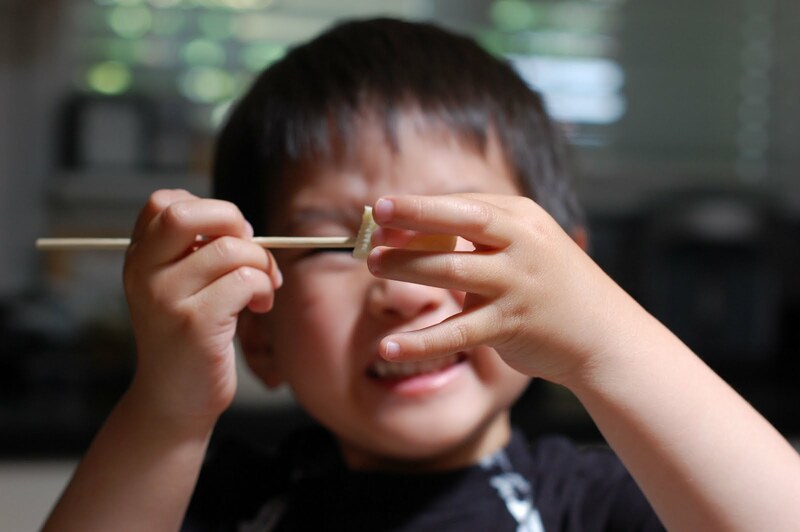 Get those kids' flossers--they really work. When they're around 6 or know how to rinse and spit, a flouride rinse is a great addition to the routine too. Ok, there's really no way I'm going to carry toothbrushes, toothpaste, and floss in my already overflowing diaper bag and brush between meals. Sorry. But there are ways to get some of the food off your teeth in lieu of stepping into a public bathroom with three kids to brush. Eating foods like crunchy apples or carrots will help to mechanically get some of the leftover food off teeth between meals. Chewing sugarless xylitol-containing gum like Trident when they're old enough is great for getting some of the sticky stuff off teeth and neutralizing the acids. (Note: Trident Xtra Care contains casein, which is not safe for those who are dairy-allergic, so read the package and ingredients carefully!). And our dentist says that drinking flouridated tap water after and between meals is the number one way to help improve our kids' (and our) dental health. Don't start me on how much money we've spent on bottled water in the past, only to learn that tap is best for our teeth. Dairy is the most well-known source of calcium. 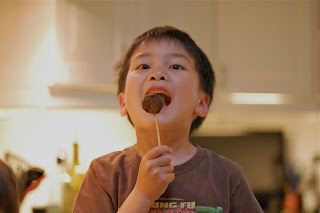 But for dairy allergic kids, you can also try non-dairy sources like your fortified non-dairy milks (like soy, rice, or almond), leafy greens like collards, kale, bok choy, spinach, and broccoli, tofu, beans, almonds and hazelnuts (for those who can eat nuts), tahini, oats, seaweed, quinoa, and sunflower seeds. 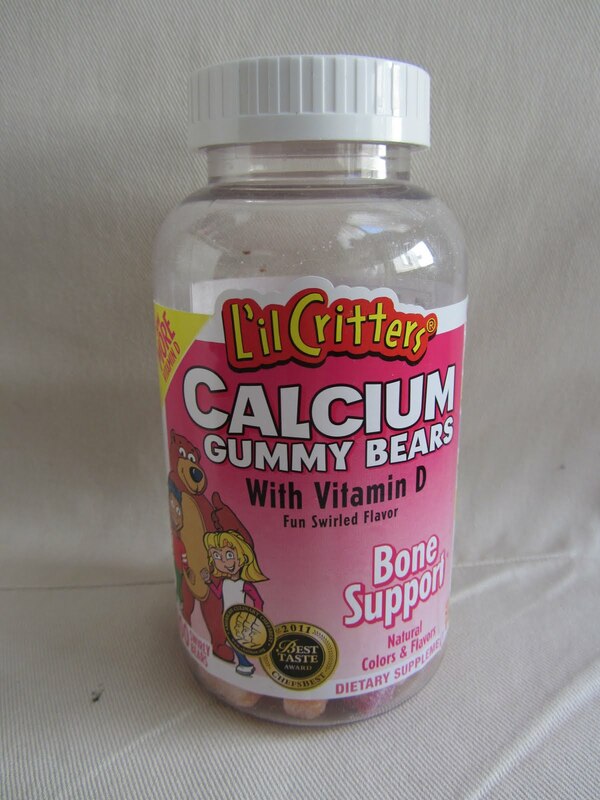 Don't forget about calcium supplements (yes, my kids love the sugary sweetness of the sticky calcium and vitamin D gummy bears, so we take them after breakfast before the morning brushing). Now that they've increased the vitamin D recommendations to twice what they used to be, it is nearly impossible for my children to get it through nutrition and sun alone, particularly since we live in an infamously foggy city. Boost calcium and vitamin D with supplements your kids will eat--gluten, dairy, egg, nut, peanut, and soy-free. 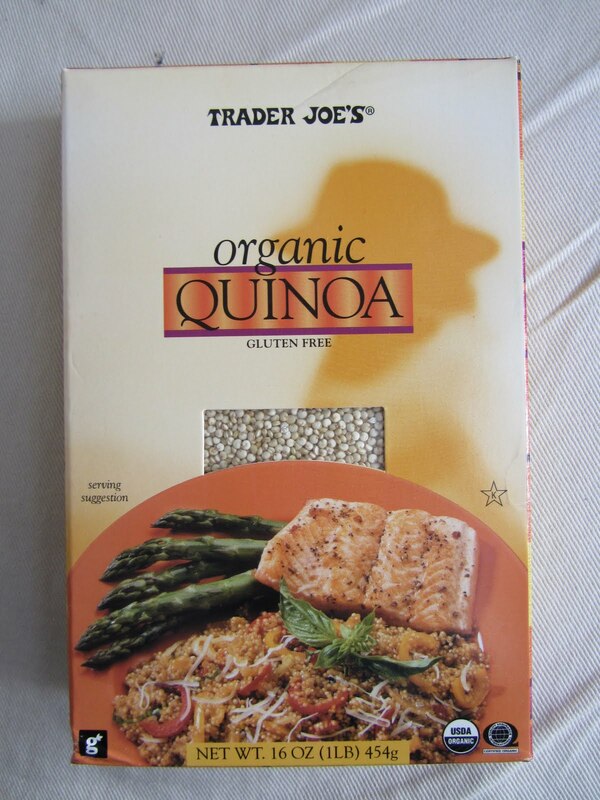 TJ's quinoa--high in protein and calcium, and gluten-free, too! If you (or your kids) haven't tasted quinoa before, it's worth a try. For some kids, the texture might take some getting used to. It's a very small grain, with a bit of a nutty flavor, and sort of pops in your mouth. Cook quinoa like rice in a pot, according to package directions. You can find boxed quinoa at your local Trader Joe's in the pasta aisle. Substitute your favorite broth and a pat of butter instead of water, and it is a stand-alone side dish. Add firm or baked tofu, cubed, with brocolli or edamame while the quinoa is cooking, and you've got a tasty dairy-free lunch packed with calcium. 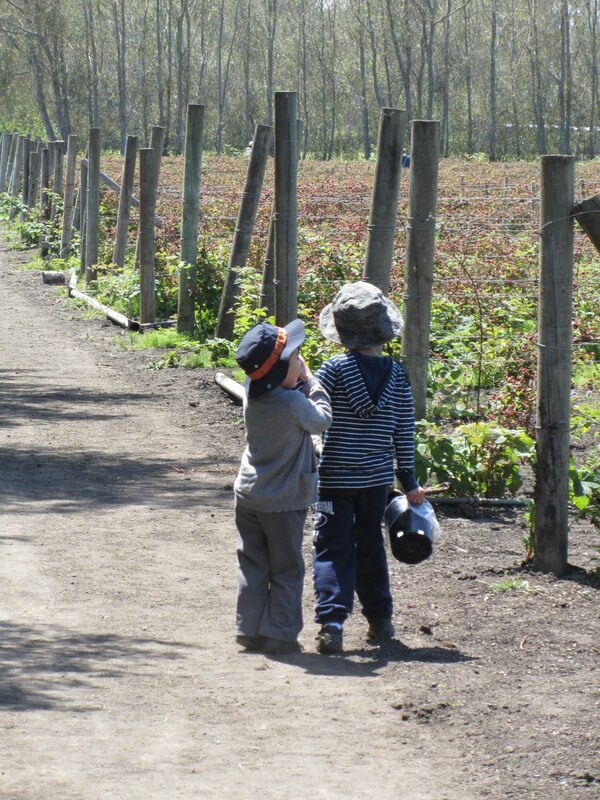 Since I mentioned olallieberry and strawberry picking in Monday's post, I thought I'd share some more about our experience--perfect for all of my food allergic kids since they could partake in all the fruit picking and tasting--very exciting! It does take a bit of planning since fruit seasons vary with the different types of fruit and also with the kinds of weather your area has been having. So do a google search, followed by a phone call to the farm to make sure that the fruit is plentiful and ripe for the picking. Then pack a picnic lunch, hats, sunglasses, sunscreen, water, and go! 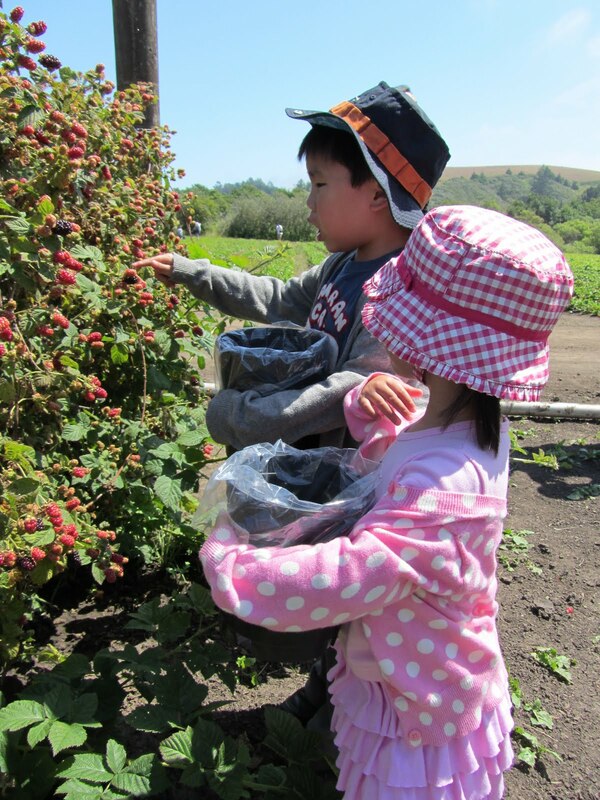 We went to Pescadero in the Half Moon Bay area to Phipps Farm, where they grow strawberries until about September, and for a short season, olallieberries (mid-June until July). They also had some birds, chickens, a hamster (? ), a little play shack, and a bunch of old tractors the kids could climb all over that the boys couldn't get enough of. Our friends brought their dog, and there were plenty of other little kids running around. 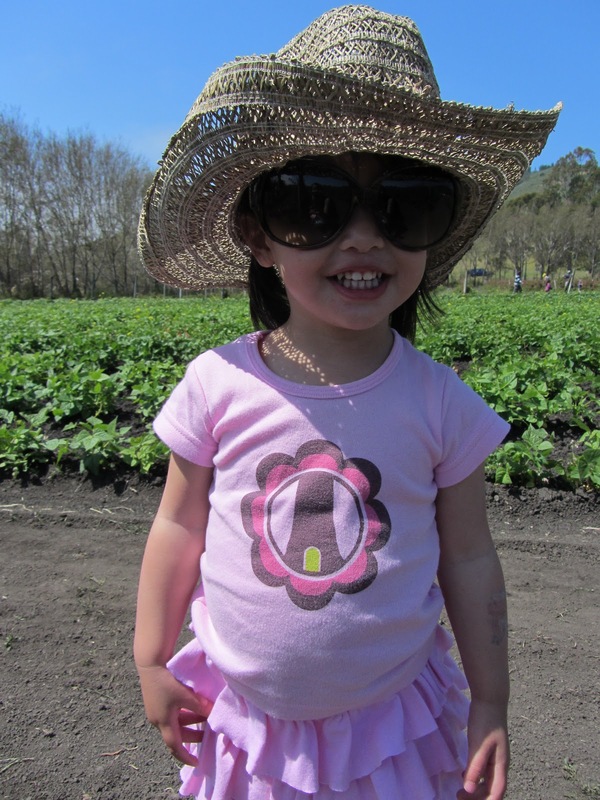 There is a nominal fee to visit the farm--it was $3 a person, ages 5-59, and then the u-pick fruit was sold additionally for $3 a pound. We ended up with several big bags of fruit and spent about $25. Five or 6 picnic tables were perfect for snacking before heading home, but be forewarned that the store didn't really sell snacks other than produce and a few cold drinks, so it's best to bring your own, or plan on eating lots of berries! 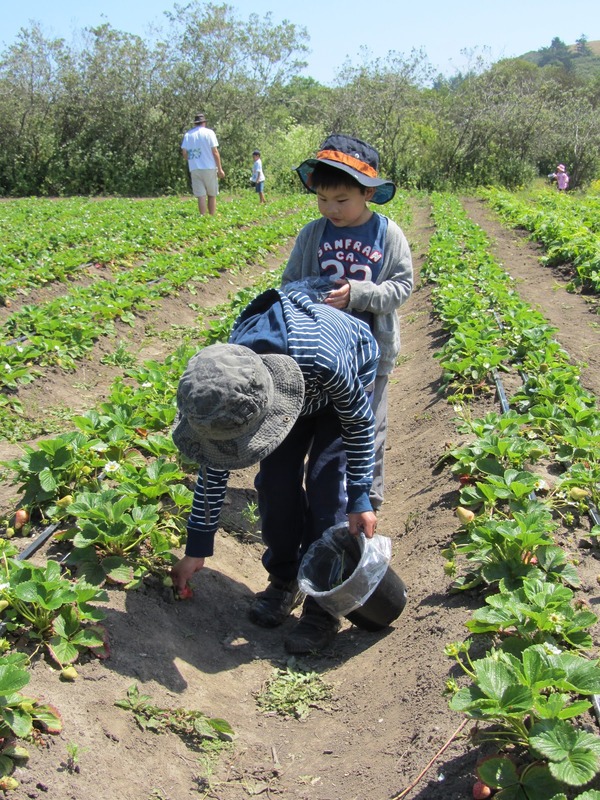 The best part about berry picking? Logan's strawberry aversion is officially a strawberry obsession. He can easily wipe out a basket in one sitting. Yay! Anyone ever try Brentwood for fruit picking? I'd love to hear your experience there. 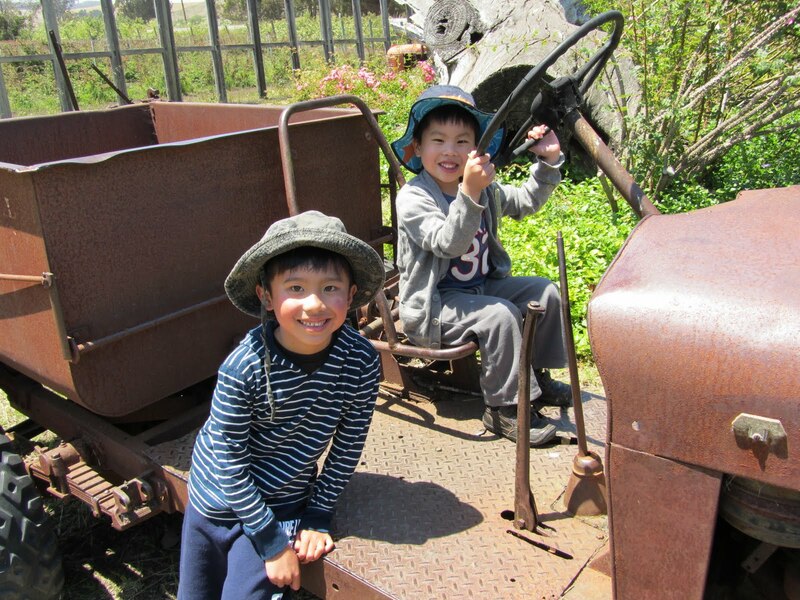 They were very excited to search for "treasures" on the farm. 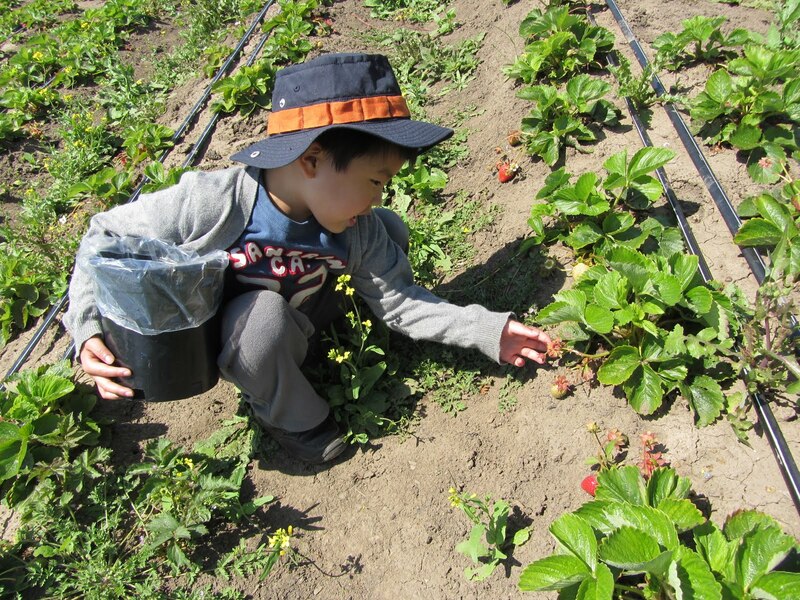 Logan was very careful to pick only the ripe strawberries. 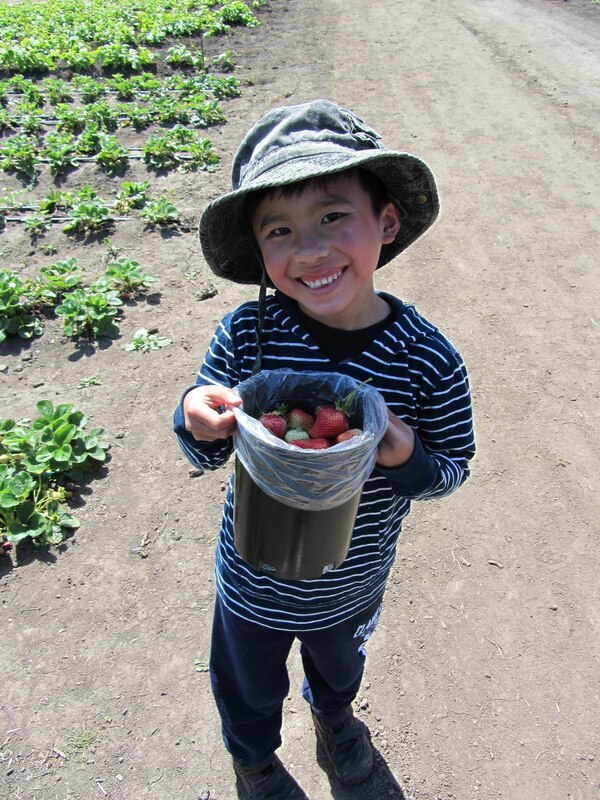 Tristan was intent on picking a full basket full of strawberries, ripe or not. Addi was all about the sun protection. 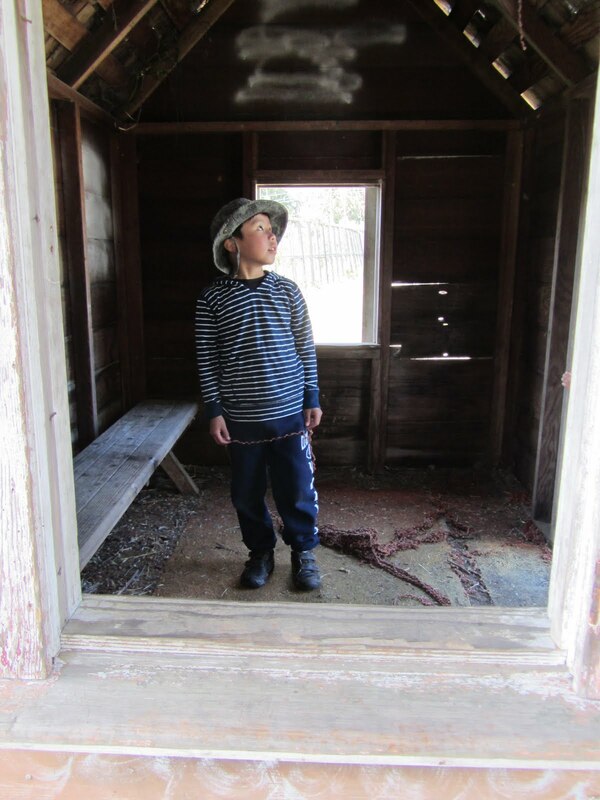 An old shack made a great playhouse for the kids after they finished their snacks. This isn't so much a restaurant review as it is a review of a single bakery item. This is solely about a vegan red velvet (VRV) cupcake, the one and only milk-free/egg-free/nut-free option offered by Sprinkles Cupcakes. From the race car fondant to the moist cake, Sprinkles vegan cupcakes were a hit! Sprinkles is a national bakery that has been all the rage of cupcake aficionados for the past several years. Originating in Beverly Hills, the bakery has helped reinvent cupcakes into a highly sought-after, elegant treat. Sprinkles' popularity is steadily growing with shops opening in major cities across the country. I tried Sprinkles cupcakes once at a baby shower and I remember thinking, "Yummy...but I'm sure I won't be eating these in my future." By that time, I was already aware of Ryken's milk and nut allergies and just couldn't eat anything with the stuff because I would feel so guilty. Flash forward six months later and, lo and behold, I was wrong about Sprinkles! They introduced their vegan red velvet (VRV) cupcake in early 2010. For the past two years Ryken has been gifted a dozen Sprinkles VRV cupcakes for his birthday by a very generous, honorary "auntie". (Non-related aunties and uncles are pretty common in Chinese culture.) Out of the company's two dozen regular offerings, the VRV is the only flavor that my milk-allergic, nut-allergic kids can eat. But, boy, is it d-e-l-i-c-i-o-u-s! My kids were particularly fond of the rich vegan frosting. Sprinkles' VRV cupcake was super moist with just a hint of cocoa. Made with soy-based cream cheese, powdered sugar and coconut oil, the half-inch thick layer of frosting was rich and sweet. Overall, the VRV is a decadent monster of a cupcake. I immediately felt like I gained a pound from eating it...but that didn't stop me from digging into another the next day. Sprinkles also offers a gluten-free red velvet cupcake. Whether they offer a gluten-free, dairy-free red velvet cupcake, I do not know but it's worth it to ask if you are GFCF! Whether you visit a store or order online, make sure you talk to a live person to discuss your food allergies to ensure your cupcakes are handled with the utmost of care to avoid cross-contamination. You can pre-order cupcakes online for in-store pickup or delivery. For the week of July 11-15, the company is offering a special Buy 2 dozen, Get 1 dozen free promotion for delivery orders. We live about an hour out from our nearest Sprinkles location but they were still able to deliver to us. I'm sure there was a delivery charge but since this was a gift I don't know what it was. You can also keep up with Sprinkles' current promotions by becoming a Facebook fan of your nearest Sprinkles or the company's main Facebook page. Cupcakes for everyone! Also known as, "Mommy, you're the best cooker!" Yes, making a strawberry dessert at 9 am and feeding it to the kids for a 10 am snack might have something to do with that very lovely compliment. Anyhoo, we had this at an Easter party at a friend's house (thanks Hanh! ), and Addison essentially licked her bowl clean. Tristan couldn't try it that day because it was made with real butter, so I decided to give it a go at home. Preheat oven at 350. Take a bit of the butter or margarine and grease the pan lightly. Wash and slice strawberries and place in pan. Mix remaining ingredients together until crumbly. Pop into the oven for about 50 minutes or until the topping is browned (if you know me, my oven is on the weaker side). I upped the oven to 450 after 40 minutes so the crumbly mixture would brown more (or broiler would be good--just keep a close eye on it). It'll be piping hot so wait for it to cool, or if you're like us and can't wait, scoop it into bowls so it'll cool faster. We went olallieberry picking over the weekend and came home with two (ok, maybe not so sweet) huge bags of berries (similar to blackberries). 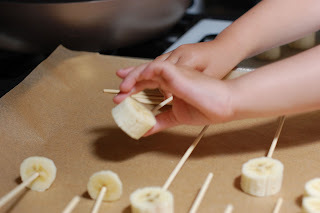 The kids might have gotten overzealous about picking, and may have picked some less than ripe ones...but they came out really yummy in this recipe. I tried the oats/flour mixture and made sure it got crispy on top. 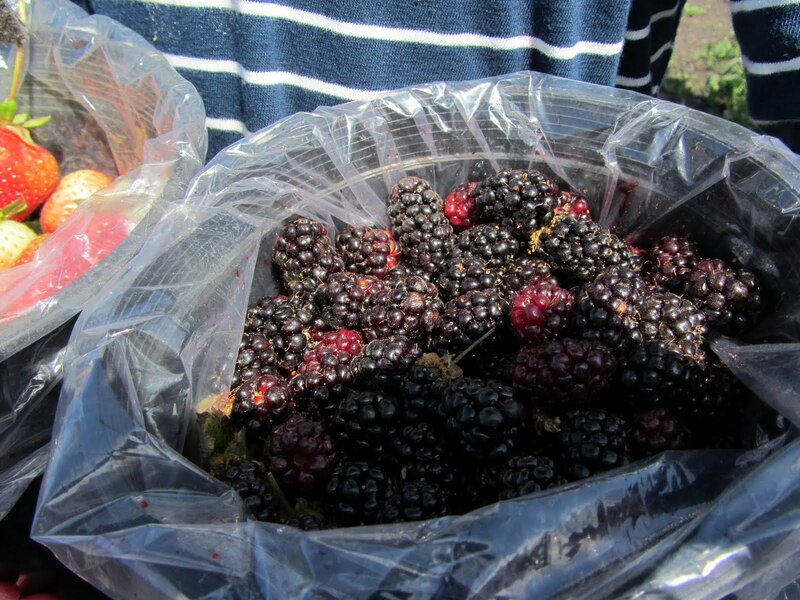 We brought home two big buckets full of olallieberries, and some strawberries, too. 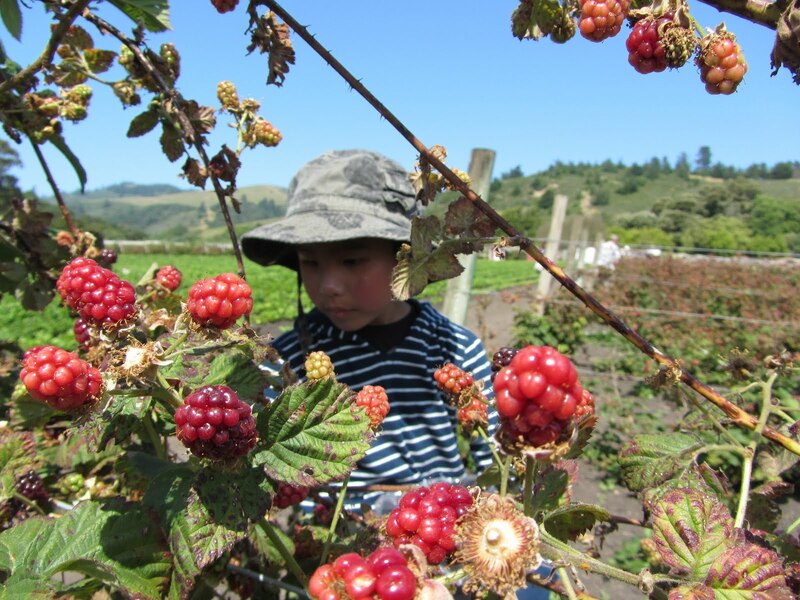 Tristan was an intense berry picker. 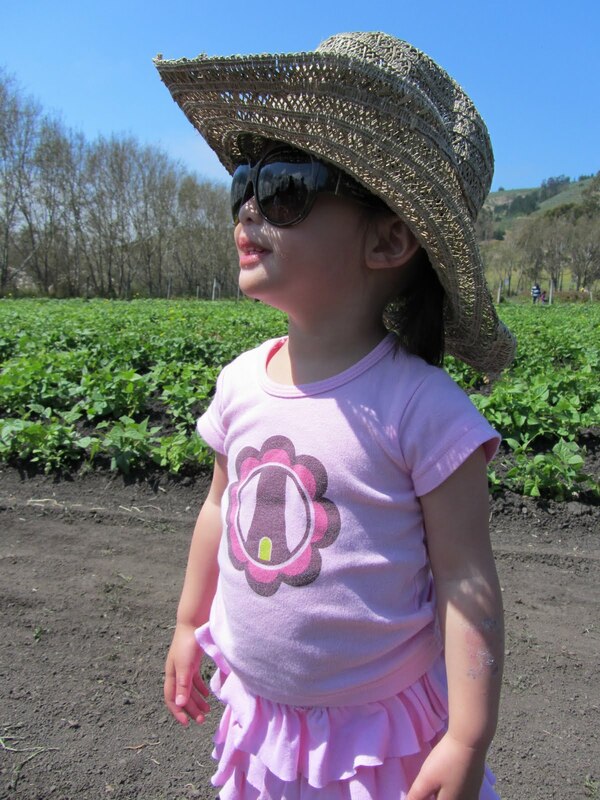 Addison wasn't much of a berry picker, but she knew how to look the part! We have not kept cow's milk in the house ever since we suspected a dairy allergy in our eldest son, Ryken. In the beginning of not knowing what was causing Ryken's horrendous eczema, we opted for rice milk so we could avoid dairy, soy, and all the other top allergens. Once I figured out that soy was not a problem for Ryken I quickly hunted for a good soy milk. I wanted something that had some richness and fat to it and rice milk just wasn't doing it for us outside of a cereal bowl. I've tried many a brand of soy milk and my all-time favorite is Soy Dream Original. It's delicious as a stand-alone drink or in recipes that call for milk. I use it in both sweet and savory dishes. Soy Dream Original has 4 grams of fat so it has some creamy body to it and some fat for my super-skinny kids. (Are all dairy-allergic kids super-skinny, I wonder?) The enriched version that we buy provides 35% of the recommendation daily allowance for calcium. It is sweetened but just enough so that my kids think they are drinking a special vanilla treat. (My kids, sadly, will not touch unsweetened soy milk unless it's hidden in a bowl of cereal or baked into a recipe.) At 4 grams of sugar per one cup serving, it has just one-third of the sugar that cow's milk brands such as Horizon Organic contains. Soy Dream Original also comes in shelf-stable packaging which means it will keep just fine without refrigeration as long as it remains unopened. This is great for stocking our pantry and relieving our already-crowded refrigerator although the package isn't recyclable so it's not great for the environment. 1 cup buttermilk = 1 Tbsp vinegar OR 1 Tbsp lemon juice + enough soy milk to fill 1 full cup. Let it curdle for 10 minutes. 1 cup heavy cream = 3/4 cup soy milk + 1/3 cup melted vegan margarine. Blend until emulsifies. Mix corn starch with Soy Dream. Pour into small saucepan. Add margarine and seasonings. Cook over middle heat, stirring milk/corn starch mix constantly to prevent corn starch from clumping. Sauce will thicken. Reduce to low heat when it begins to bubble. Cook until it stops thickening. If the sauce is too thick for your liking, add a little more soy milk. If it's too thin, thoroughly mix 1 tsp corn starch with a little bit of soy milk, then pour into the heated mixture, stirring constantly so that the new cornstarch doesn't clump. You might want to take the pot off the heat while you're doing this. You can add more seasonings, nutritional yeast, or vegan cream cheese for a stronger-tasting cream sauce. Besides its original soy milk, Soy Dream's product line includes flavored soy milk and frozen desserts. There are also rice milk and almond milk products sold under the same Dream label. Visit the Dream website for a printable coupon worth $1 off of 2 products. 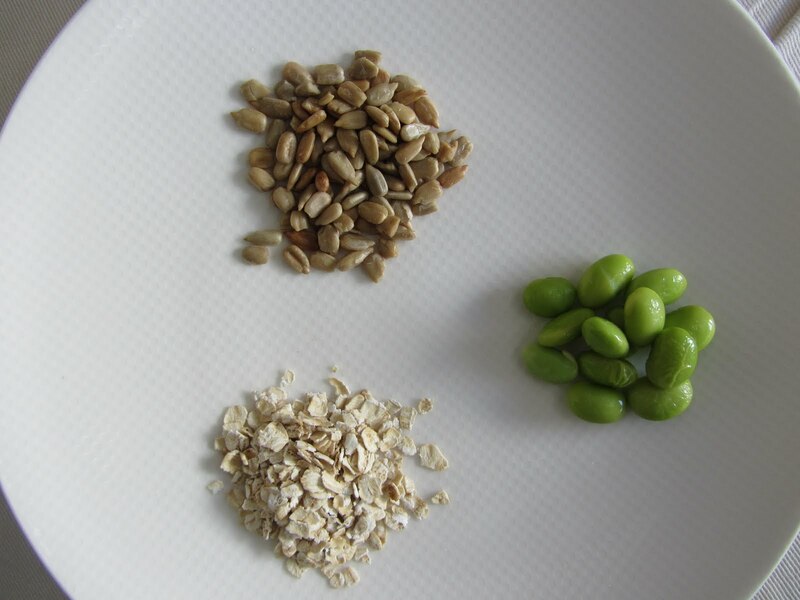 Lastly, before diving into Soy Dream, read up on the growing controversy surrounding the use of processed soy products. Even though my family loves Soy Dream, the uncertainty over the long-term health effects of consuming soy is alarming to me. I am trying to use Trader Joe's Organic Whole Grain Milk in baked goods when possible (muffins and cakes work well) and to mix with Soy Dream so they aren't consuming as much soy. Dairy-free Ice Cream - Kale Mint Chip and more. Yes, we can! My eldest son, Ryken, has been obsessed with soy ice cream ever since his first bite at 2 years of age. It never fails: at the first hint of warm weather he proclaims, "Today is a good day for soy ice cream!" Sunny or not, the kid can't go three weeks without mentioning it in conversation. Recently on my local mothers' club message board, someone inquired about ice cream makers. This piqued my curiosity. I had never owned one or thought about owning one but it sounded easy to use. And it made a lot of sense. Summers are blazing hot in my neighborhood and dairy-free, nut-free ice cream is expensive and often hard to find. After reading moms' reviews and reviews on Amazon.com, I became convinced that a Cuisinart ice cream maker was a great investment. Ice cream maker, where have you been all my food-allergic life?? I started using our ice cream maker two weeks ago and have already made 9 batches of ice cream. Our family hasn't finished all the ice cream but we are stockpiling different flavors in the freezer. I've become obsessed with trying out recipes! The Cuisinart is so easy to use and clean, and can be ready to go every 8-24 hours depending on how cold your freezer is. So far I have searched for "vegan ice cream recipes" and found a lot out there. I've played around with 6 different recipes: vanilla, chocolate chai, cherry chocolate chip, banana chip, coffee, and mint kale chip. You heard me right. Kale. The first recipe I tried was chocolate chai ice cream from Cathe Olson's vegan ice cream book Lick It. I followed it to a tee and it was a big hit! I was worried that the chai would be too spicy for my kids but they loved it. The spices added a little kick of flavor and the coconut milk was really key to the rich creamy taste. Many of Olson's recipes use coconut milk so if you are in the market for dairy-free, soy-free recipes, definitely consider this book. I followed the cherry ice cream and banana ice cream recipes pretty closely except I used a mix of soy creamer and soy milk to bump up the fat content, and I did add semisweet chocolate chips. I really liked the cherry flavor although I think the thinner chocolate shavings would be better than chips. I tried a vegan vanilla that I found on Vegweb. For the nondairy milk I used my soy milk of choice, Soy Dream Original. I let Ryken, whose favorite ice cream is vanilla, be the final judge of the ice cream -- and he loved it! He declared it every bit as good as the vanilla soy ice cream we've bought from Trader Joe's in the past. I thought it could use a richer texture so I have made a point to use coconut milk next time. Below are two recipes that I adapted using more coconut milk than soy milk. The texture of all of these recipes is best when it's just been churned. They harden when stored in the freezer and will definitely need time to defrost before you serve. I've read that the vegan way to improve the texture is to add a couple tablespoons of arrowroot powder (you'll have to dissolve it in heated liquid). Since I couldn't find arrowroot in any stores and I wasn't ready to commit to 3 lbs of the stuff from Amazon.com (or its $23 price tag) I did without it. No other ice cream flavor makes me happy like coffee ice cream. This one isn't great for the kids because of the caffeine but mama's gotta treat herself goood sometimes, right? Add 3/4 cup sugar to 1 cup of hot coffee. Stir to dissolve. In a large bowl, blend together coconut milk, milk alternative, and coffee mixture. Once it is well blended, let it cool on the counter. Then refrigerate. Chill until you are ready to make your ice cream. For best texture, serve immediately after your ice cream is made (about 30 minutes with a Cuisinart ice cream maker). I know what you're thinking: Kale...ICE CREAM?!? That was my first thought, too. My second thought was, I MUST TRY THAT. Part of the allure is trying a new way to get my kids (especially Callan) to eat more leafy greens. The other draw is the sheer strangeness of it all. Bay Area folks, if you have ventured to Gilroy's Garlic Festival for garlic ice cream, this is right up your alley. I scream, you scream, we all scream "KALE ICE CREAM?!?" Combine chopped kale, coconut milk, and milk alternative in blender or large mixing bowl if you are using an immersion blender. Blend until smooth. Add sugar, mint/peppermint, vanilla, and oil. Blend again to combine. I used an immersion blender since my semi-broken regular blender leaks. My mixture consisted of tiny flecks of kale -- couldn't completely blend them away -- but maybe stronger blenders will have better results. Taste the mixture. Add more sugar and/or mint as needed and retaste until it suits your needs. Refrigerate mixture until you're ready to make ice cream. After the mixture has been churning in the maker for 20 minutes, add semisweet shavings. If you're not in a rush to eat it, transfer your finished product into a freezer-safe container. I actually liked the taste of this ice cream better after it had more time to freeze. Ice cream tip: Always taste your mixture before you transform it into ice cream. Not all milk alterrnatives are created equal -- some have more sugar than others or more of a vanilla slant. Your mixture is essentially melted ice cream and, as such, should taste just as good! I *think* all these recipes can be made gluten-free but please check all ingredients yourself. (Sorry. Summer break. Kids at home. Heat wave. Chaos. Exhaustion.) All in all, I think I was most impressed by the chocolate chai and coffee flavors. I am definitely sold on using a can of coconut milk to serve as 2 cups of milk alternative. Ryken didn't like the mint kale chip (no fooling him) but Callan was all over it. Perhaps he hasn't had a long enough relationship with dairy-free ice cream to want to refuse any of it? No matter to me. I was happy that he ate it all up without complaint. 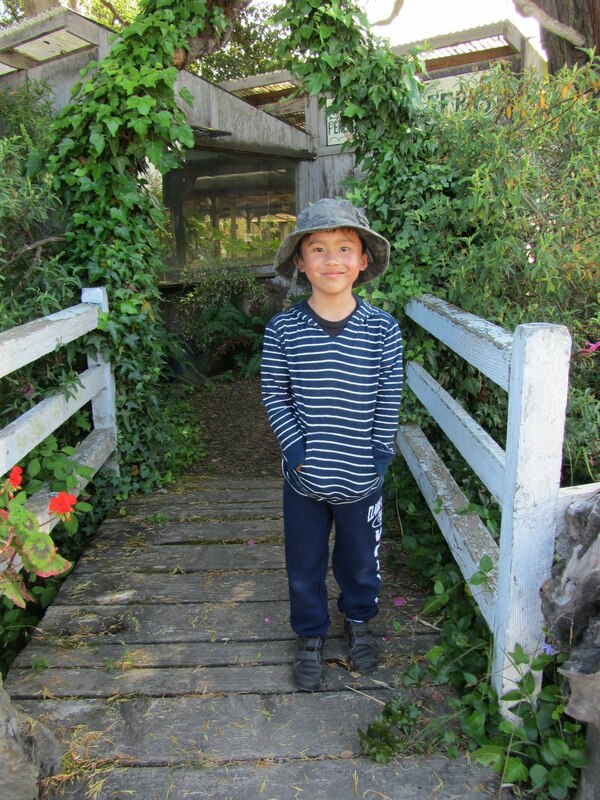 Our family is so grateful for the outpouring of well wishes we received after posting about Tristan's anaphylaxis scare. Thank you so much--your support is felt and appreciated! On jun 28 I felt hot. And I couldn't breathe. I needed to take my eappen. And after I could breathe. And after I went to the hospital. When I was at the hospital. I was in a chair. the chair was big. When I was at the hospital siting in a big chair waching tv. In 3 howers I went home. The end. Thanks again everyone! Happy fourth...and don't forget your epipens! Last week we shared recent headlines about the increasing rate of food allergies among children. 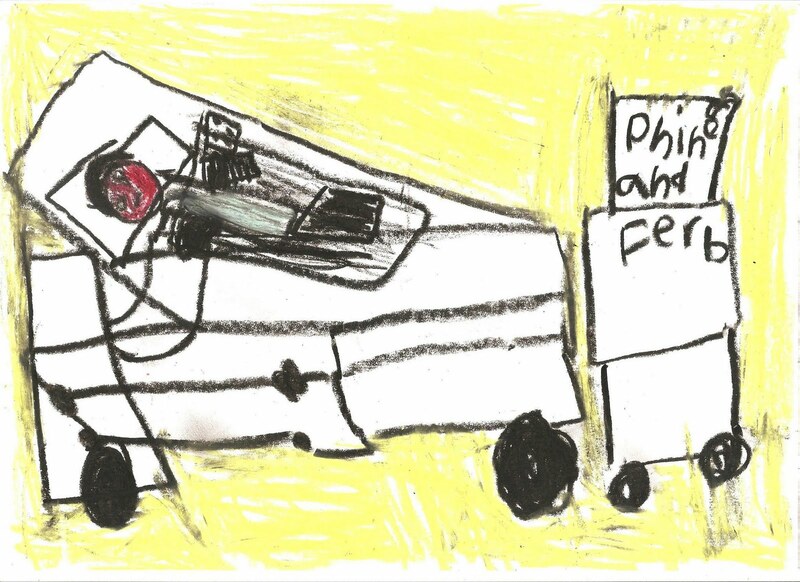 One family affected by food allergies was the Hom family. The summer of 2008 was supposed to be a time of celebration for parents Brian and Kathy Hom. BJ, the eldest of their three sons, had just graduated from high school. The family took a vacation to Los Cabos to celebrate the occasion. Arriving at their hotel after 8:00pm, the family rushed to catch the dinner buffet without unpacking anything. After dinner as they were starting a walk around the hotel, BJ, who was peanut-allergic, complained that his throat hurt and asked his dad for cough drops. Within minutes BJ collapsed in the hotel lobby, body pale and lips blue, unable to breathe. BJ died a short time later, a horrifying result of anaphylactic shock to peanuts from a buffet dessert. Since that day BJ's father, Brian, has been on a painful but important mission to tell his son's story. He has spoken at various food allergy conferences and connected with many online food allergy blogs and health news outlets. Mr. Hom's goal is to build awareness of food allergies and their potentially fatal impact if gone undiagnosed or untreated. His message is simple and clear: be proactive about testing and retesting for food allergies, be cautious of outside food, and always always carry life-saving medication no matter how mild you believe the food allergies to be. 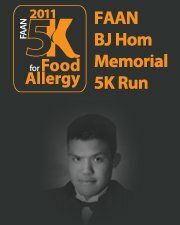 On October 8th the Homs will shine a spotlight on food allergies with the BJ Hom Memorial 5K Run. The event will take place in San Jose, California, (BJ's hometown) and will raise funds for the Food Allergy & Anaphylaxis Network (FAAN). Registration is $30 online or $35 for day-of registration. You may register individually or with a team. Participants are free to run or walk, and strollers and wagons are welcome if you walk. We at Get Allergy Wise would like to form a team for the run/walk (who am I kidding? *walk*). The suggested fundraising goal is $300 per person. This is suggested not mandatory so please don't let this deter you from participating, although I think $300 is a very doable goal. I'm thinking of our friends and relatives that care so much about our kids but don't exactly know how to help. This fundraiser offers them a way to help. For more information on the run, check out the Facebook page for the event.